My bullish views on uranium in the mid- to long-term are well-documented. That said, it has been 21 months since I formally wrote about my optimism regarding the uranium industry (Mercenary Musing, December 16, 2013). Today I elucidate my current thoughts on the sector. 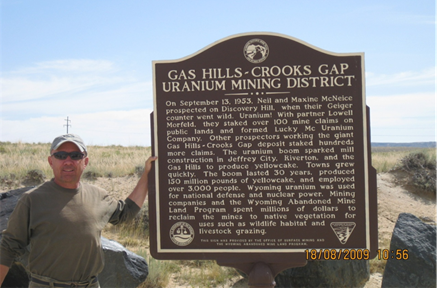 I first went public with contrarian views on uranium during the depth of the global financial crisis in the late fall and early winter of 2008-2009. In addition to speaking about the commodity in interviews, I initiated coverage of two Athabasca explorers and both were eventually acquired by major mining companies. One produced more than a double (Mercenary Musing, November 24, 2008) and the other a triple (Mercenary Musing, January 14, 2009) respectively for my portfolio and subscribers who chose to follow my lead. Although I boldly predicted a rising uranium price in January 2009, it took over 18 months before that occurred (contrarianism always requires patience). In August I posted a piece entitled, “Uranium, the New Green Metal” (Mercenary Musing August 9, 2010). By November I was speaking on uranium as “the next big thing” and it veritably was, with the spot price going from $40/lb in July 2010 to $73 in early February of 2011. Then a black swan event occurred on March 11, 2011, with the 9.0 earthquake in northeastern Japan (the fourth largest in recorded history), a subsequent tsunami, and the nuclear power plant accidents at Fukushima-Daiichi. Uranium stocks crashed in mass over a few market sessions, and I have argued that this event was the catalyst that roiled the Toronto Venture Exchange into the ongoing bear market (Mercenary Musing, December 15, 2014). 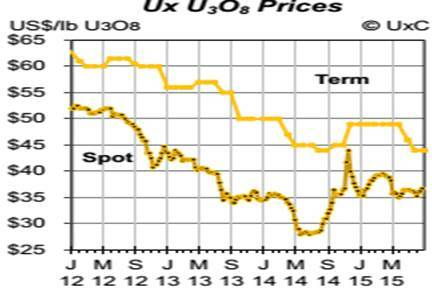 Over the subsequent three years, the spot price of uranium fell from that ephemeral high of $73 to a low of $28/lb, a loss of over 70%. Meanwhile the term contract price dropped from $75 to $40/lb. The uranium price crash has been directly related to decrease in demand from Japan. Before the incident, Japan used about 12% of the world’s uranium in its 55 reactors and was the third largest consumer in the world behind the USA and France. For the past three years, the 48 remaining operable reactors have been shuttered for safety inspections, modifications, and new permitting. Five have been retired. One reactor restarted last month, another is scheduled to reach criticality this month, and two more should be online by year’s end. An additional 19 have applied for restart approval. It is generally thought that about 25 reactors will eventually generate electricity. In 2010, worldwide nuclear power plant demand was 167 million pounds U3O8. 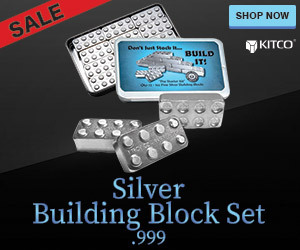 There were 142 million pounds mined and 23 million pounds of secondary supply from conversion, enrichment, and government stockpile sales resulting in a two million pound deficit. In 2014, demand was 175 million pounds. There were 148 million pounds mined and 43 million pounds of secondary supply to the market resulting in a 16 million pound surplus. According to the World Nuclear Association, Japan consumed on average nearly 22 million pounds per year from 2007 to 2010. Germany also shut down eight of its 17 reactors in the wake of Fukushima and that cut its annual demand by half. The removal of demand from Japan and, to a lesser extent, Germany from 2012-2015 has been devastating to the uranium market. It has also been devastating to the Japanese economy, with an additional $40 billion per year in imported fossil fuel costs. Despite a 30% rise in spot prices over the past year, the market remains depressed and is off about 50% from its high in early 2011. Therefore, it is of little surprise that uranium equities continue to lag behind the upward movement in the spot price. Contract uranium deals are mostly done privately with only vague details and terms released in public documents. That said, transparency has improved considerably over the past ten years. Broker bid/ask spot prices are now tracked and posted daily. However, uranium trading continues to be a largely opaque market. Supply and demand fundamentals require that buyers exceed sellers, so the most important catalyst is the return of utilities, traders, and speculators to the spot market. China continues to stockpile U3O8 for its ongoing nuclear build-out. There are 28 reactors under construction, 43 planned, and 136 proposed. Japan continues with reactor restarts in a timely fashion. There has been speculation that Japanese utilities have periodically sold stockpiled uranium into the spot market to generate cash for purchase of expensive alternative fuels, mostly LNG and oil. Whether true or not, reactor restarts would result in resumption of contracted deliveries that have been on hold since the country-wide shut down. Supply disruptions, destruction, and delays will likely continue until prices rise. In recent months, there have been additional mine closures, production cutbacks, suspension or outright cancellation of new project developments, and long permitting delays. As always, the cure for low prices is low prices. The geopolitical situation between Russia and the Ukraine continues to worsen. Both are significant uranium producers. 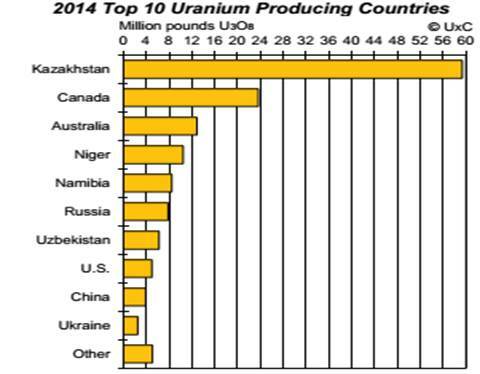 62% of the world’s uranium supply came from these six countries: Kazakhstan, Niger, Russia, Uzbekistan, China, and Ukraine. These six of the top ten producing countries have corrupt and/or unstable governments and must be considered unfriendly to the USA. Kazakhstan alone produced 41% of the world’s uranium. The United States consumed 51 million pounds of yellowcake yet produced only five million pounds, less than 10% of its annual demand. Nuclear reactors now provide 14% of the world’s electrical energy and, given the new plants coming online, that percentage is likely to increase going forward. The percentage is even higher in the good old US of A at 19%. In other words, when one out of every five Americans switches on a light at night, that electricity is generated from nuclear fuel. There are now 437 operable nuclear power plants worldwide; that is four more than the pre-Fukushima count. According to the World Nuclear Association, there are 66 nuclear power plants under construction and another 166 are currently planned, i.e., approved with funding completed or committed. The world averages one new reactor coming online every two months. The ongoing nuclear buildout will result in increasing demand for yellowcake and is projected at 3-4% annualized growth. Analyst consensus projects a significant deficit for mined uranium and secondary supplies in the mid- to long-term. Opinions differ as to when the deficit will commence but are generally in the range of 2017-2018. The sources of new supply are problematic because conventional underground uranium mining and milling requires significantly higher prices to be economic, generally estimated at $65-80/lb. 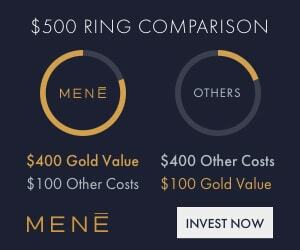 Lower cost mines, either in-situ recovery (ISR) or open-pit heap leach, are at best breakeven at current prices. The logical conclusion is that uranium prices must nearly double to meet projected demand by the later part of this decade. 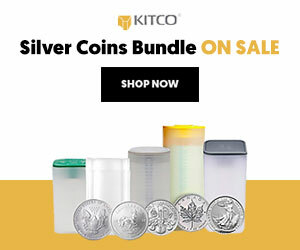 Meanwhile, sovereign stockpiles are dwindling; higher cost mines continue to cut production or are being shuttered; major new projects have been and will continue to be delayed or shelved; and the Russia-USA supply deal thru 2023 is just half of the amount supplied by downgrading of weapons-grade to reactor-grade U3O8 from 1993-2013. 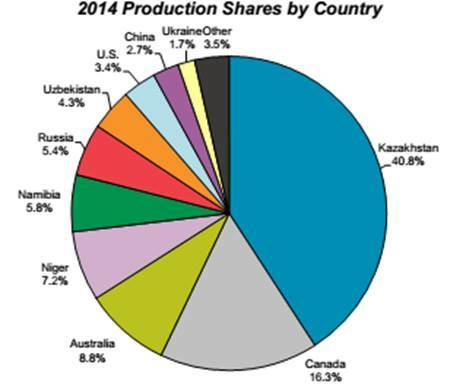 So where will new uranium supply come from to meet the growing demand? Mined uranium and secondary supplies will both be parts of the solution. Recycling and reprocessing are increasing every year but they still produce only a minor amount of the world’s total uranium supply. Enrichment underfeeding will continue to contribute to supplies. Mining, however, will remain the major contributor to future supply and prices must increase for new mines to be developed and come on stream. Since the uranium renaissance of the mid-2000s, increased demand has been mostly met by Kazakhstan, which has gone from 11.5 million to 61.1 million pounds of U3O8 production over the past decade. However, its shallow and high-grade ISR mines in the north are being depleted and production is increasingly moving to southern districts that are deeper, lower-grade, and more difficult to recover. Therefore, there are doubts if Kazakhstan’s current production level is sustainable. Canada’s Athabasca Basin is the site of the world’s largest and highest grade uranium mines. Exploration success continues in the Basin but these deposits require high capital expenditures and very long lead times to development and mining, now estimated at 15-20 years. There are world-class sandstone uranium mines and development projects in Niger. But the country is plagued by a corrupt bureaucracy and unstable government, and its mines have been repeatedly targeted in civil wars and Islamic terror attacks over the past decade. The open-pit mines in Namibia are very low grade, unprofitable at current prices, and have water supply issues in the world’s second driest desert. Projects require desalinization plants on the coast with pipelines to mine sites in the country’s interior entailing high capital expenditures. 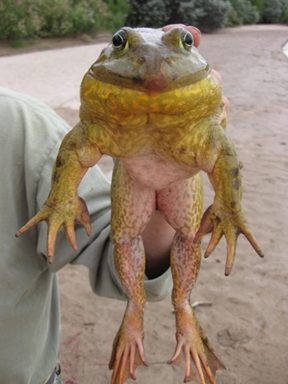 The western United States is the world’s second-most endowed uranium province. Two sandstone uranium deposits in the Grants Mineral Belt of New Mexico contain giant, high-grade resources but will be underground mines that require higher prices for financing and development. Smaller, moderate-grade sandstone-hosted deposits occur in Utah, Colorado, and Wyoming but again are relatively high cost underground mines. High-grade resources occur in breccia pipes of the Northern Arizona Strip but most of this prospective ground has been removed from mineral entry by the US government. A huge, high-grade sandstone deposit in Virginia is subject to a state government moratorium on development. ISR mines in established districts in Wyoming and South Texas are low capex and low cost with relatively fast timelines to permitting, development, and production. However, these are small sandstone uranium deposits, generally in the range of 1-10 million pounds that require sequential well field development and ongoing sustaining capital to maintain production. Larger (20 to 100 million pounds) ISR-amenable deposits in New Mexico are burdened by long lead times to permitting. Unconformity deposits in the Northern Territory of Australia are high-grade giants but face geopolitical hurdles stemming from ongoing governmental and aboriginal opposition to the mining of uranium and with no current timeframe for development. As a patriotic American, I am very concerned that we produce less than 10% of our yearly demand for 99 operating nuclear power plants. It is hard to imagine, but over the past 30 years the United States has gone from being the world’s major producer, supplier, and exporter of uranium to a massive importer of nuclear fuel. Although most of our imported uranium comes from Canada and Australia, our dependence upon unfriendly foreign sources is not only significant but increasing. Domestic demand will continue to grow with many older nuclear power plants being refurbished to produce more power more efficiently and five new plants are under construction. We certainly have the uranium resources in the Western US to become self-sufficient again. But I doubt we have the political will. That said, where and what will be the new domestic sources when prices inevitably rise? Wyoming, South Texas, and South Dakota ISR projects currently in permitting and development. Arizona, Utah, and Colorado conventional underground mines that are currently on standby and will feed the White Mesa mill in southeastern Utah. Gas Hills and Sheep Mountain, Wyoming projects that will be open-pit mines and likely employ heap-leach recovery. Grants Mineral Belt, New Mexico high-grade conventional underground mines feeding the White Mesa mill and/or a custom toll mill in New Mexico. Lower grade ISR projects are also a possibility if opposition from NGOs and Indian tribes can be overcome. I remain a uranium bull imply because the mid- to long-term supply-demand fundamentals are compelling. The current 20-30% shortfall of mined uranium versus annual demand will be exacerbated within the next 2-3 years unless prices rise substantially. There are now 66 new commercial-size reactors under construction; 166 are planned, and 322 are proposed. Uranium mining is largely unprofitable, utility and government stockpiles are dwindling, and the increase in recycling, reprocessing, and enrichment supplies cannot meet projected annual growth demand. Despite the recent downturn in commodities demand, there is one energy resource that continues to grow worldwide: the demand for electricity. Much of that growth is coming from emerging market countries that are largely rural and not yet electrified in the Asia Pacific, Latin America, and to a lesser extent, sub-Sahara Africa. Folks, there are 85 million more humans on Earth every year and 25% of them still go to bed at dark and rise at dawn. But that paradigm is changing rapidly, especially with urbanization in China and India. For the next two to three decades and perhaps longer, nuclear energy will remain the planet’s only source of base-load electricity without a significant carbon footprint. 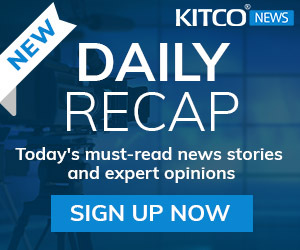 I maintain a contrarian speculating and investing philosophy and opine that now is an opportune time to take positions in uranium explorers in the Athabasca Basin of Canada and developers and producers in the United States. As always, contrarianism requires patience and a longer outlook. Over three decades of investing in the resource industry, I have learned to follow the smart money and those individuals and entities have been and are speculating in uranium equities. 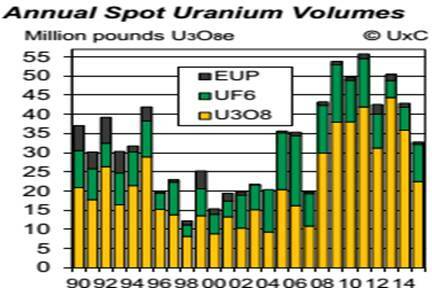 Annual USA Department of Energy spot market sales continue to disrupt uranium prices. 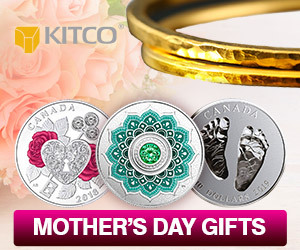 Under a formal agreement with the Uranium Producers of America, the government agreed to supply no more than five to seven million pounds of U3O8 equivalent to the market annually and to not disrupt the spot price with its short-term sales. However, since the Obama administration took control in 2008, the DOE has repeatedly violated this agreement. For example: When the spot price reached $39/lb in late March to late April and briefly touched $40, the DOE immediately dumped three million pounds U3O8-equivalent on the market in conversion form (UF6). This resulted in the spot price dropping to $35 and change in little more than a week. There is current legal action making its way thru the court system with US conversion company ConverDyn suing the DOE for its actions over the past seven years. Atomic bomb dismantling is on hold and has been since the USA-Russia HEU to LEU program ceased in 2013. This is despite Obama’s bully pulpit pledges in 2009, 2011, and 2013 to rid the world of nuclear weapons. That said, downgrading of weapons-grade to reactor-grade uranium remains a significant potential source of nuclear fuel. Japanese reactor restarts have finally commenced but evidently will proceed slowly. Two reactors are now online and producing electricity and two more are scheduled for startup by year’s end. There are an additional 11 applications for restarts. Industry consensus is that only around half of Japan’s nuclear fleet of 50 operable reactors will eventually receive approval for production. Reprocessing of used nuclear fuel to extract fissile materials for recycling and to reduce the volume of high-level wastes is a long-lived technology first developed in the late1940s to recover plutonium for atomic weapons. Countries that currently reprocess used fuel for commercial reactors are France, India, Netherlands, Russia, and United Kingdom. A significant amount of plutonium recovered from the used fuel is immediately recycled into mixed oxide (MOX) fuel, mainly in Europe. MOX supplies 5% of annual nuclear fuel demand; as of now, only a small amount of recovered uranium is recycled. New reprocessing technologies are in development for fast neutron reactors, which will burn all long-lived actinides, including uranium and plutonium. Alternative nuclear reactor types including fast breeder reactors, small modular reactors, and thorium-based fuel reactors remain 10-15 years from impacting the current single-fuel run, open cycle, uranium-based nuclear industry. Another black swan event a la Fukushima, but enough has already been said about that. H2 2005 - H1 2007 Boom. H2 2007 - 2008 Bust. 2009 - H1 2010 Flat and out of favor. H2 2010 - Q2 2011 The next big thing. Q2 2011 - Present Bust. My future’s so bright, I gotta wear shades.